Named sole heir to her aunt's estate, Charity Gannon arrives in the Northeast Kingdom of Vermont, hoping to find a link to her past. She's not looking for lost treasures; she is searching for a connection to the aunt she barely knew. What she finds is a thirty-something-year-old mystery and questions with no answers. A sad, secluded cottage, all but hidden amid the vines. A man's suit of clothes, tainted with dried blood and a bullet hole. Four forgotten boxes, stuffed into a large bag and buried in the far corners of the shed. These are not just any boxes. These are unopened, undelivered boxes, left behind by the now-defunct Kingdom Parcel. All four boxes are marked March 14, 1984-the very day her uncle, president and driver for the delivery service, was said to have committed suicide. Four forgotten boxes, whose owners might still be out there, waiting for a delivery that never arrived. The undelivered boxes haunt Charity, tugging at her conscience. Hadn't someone noticed them missing? 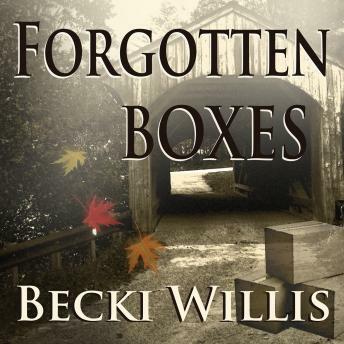 As Charity sets out to deliver the packages to their rightful owners, she discovers that the story behind one box is delightful. Another is heartbreaking. And one might very well be the death of her.